Mother Night [Book Review] – my books. my life. Mother Night is the story of a Nazi who may or may not also be an American spy. He’s now in a prison in Israel awaiting his war crimes trial. While imprisoned, he shares his story both during and after the war. There is some strange stuff going on in this book. And I would expect nothing less from Kurt Vonnegut. I enjoy watching how he twists and turns a novel in directions I could never dream of. 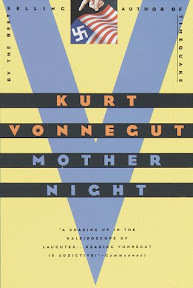 Mother Night is my fourth Vonnegut and I think I’ve come to the conclusion that I prefer his more science-fictiony works. I loved Cat’s Cradle. Liked Slaughterhouse Five. Really disliked Bluebeard. And feel kind of meh about this one. I liked it alright while I was reading it but I really don’t have much to say and I really didn’t think about it much once I’d finished. I do appreciate Vonnegut’s ability to take someone that we should all properly despise (a fairly high level Nazi) and complicate him to the point that we don’t know exactly what we think about him. I don’t think many people could do that. I’d love to hear your thoughts if you’ve read this one. I feel terrible saying this…but I’ve never read Vonnegut. It’s pretty awful of me, I know, and I plan to pick one of his books up soon(ish). This one sounds pretty intense, but interesting. I’ve tended to enjoy the Vonnegut I read, but forget about the books soon after. They never seem to make a huge impact. Hey Michelle! Bluebeard was my first book of his to read, and I didn’t like it either. And thus, haven’t read anymore from him. I think I’ll try Cat’s Cradle – give him a 2nd try! 🙂 Thanks! I hope you enjoy Cat’s Cradle. I liked that one a lot.